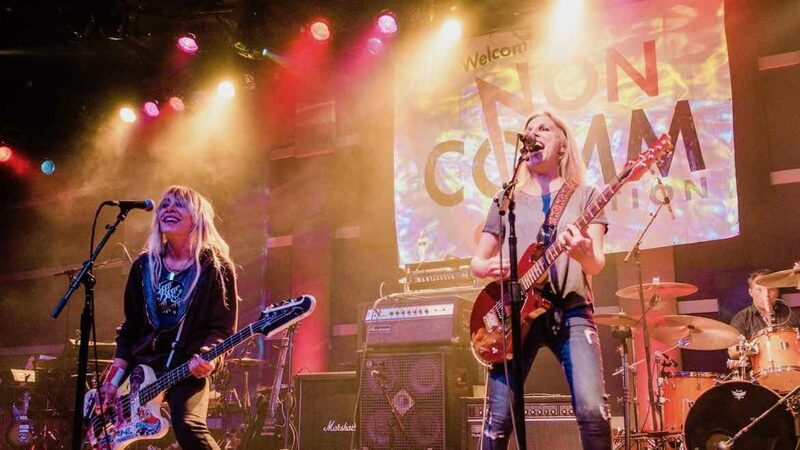 Gail Greenwood and Tanya Donelly of the band Belly perform May 18 at the Non-Commvention in Philadelphia. The Non-Commvention at WXPN in Philadelphia included a groundbreaking panel this year. For what may have been the first time, attendees at the gathering of public radio Triple A music programmers May 15–18 took part in a discussion about the place of women in their format. Moderated by The Current’s Lindsay Kimball, the hourlong conversation included a discussion of the challenges that women face working in a male-dominated industry and details of how many (or few) female artists are represented on the charts. Many panel attendees expressed disbelief that this kind of discussion hadn’t taken place earlier. Sexism has a long history in the music business, but Triple A stations, and especially noncommercial stations, often see themselves as progressive and pride themselves on giving women more than a few token spots on their playlists. This view that public radio stations are beyond dealing with gender bias may be feeding a lack of awareness about inequalities on playlists and among station management. In preparation for the Non-Comm panel, I looked at data from Nielsen BDS, the service that tracks airplay and serves at the basis for Billboard music charts. Its Triple A chart tracks new music and includes both commercial and noncommercial stations. I also examined upper management at the format’s leading stations. My review of playlists found that while a scarcity of female voices is typical in commercial rock formats, it’s a problem in Triple A, too. On the Nielsen BDS chart during the week of Non-Comm 2018, only nine of the top 40 songs were by female artists. This included songs by bands with female members that aren’t necessarily fronted by women, such as Arcade Fire, The Lumineers and The Head and the Heart. In other words, this was a generous look at how many women are represented on the charts. I also analyzed the most-played Triple A “gold” songs — older tracks in station playlists that are generally considered hits deserving of a long-term place on the air. Five songs out of the top 40 gold tracks were by female artists or bands with women in them. Of those five, only two — Elle King’s “Ex’s & Oh’s” and “Dreams” by the Cranberries — actually featured a female lead vocal. When I excluded commercial Triple A stations, I found that women made up a decent share of the top 40 new songs in public radio: 16 songs, or 40 percent of the top 40 songs. But the gold chart still showed only 11 female artists in the top 40. And when I took a broader view of airplay of new songs, looking at noncommercial stations from July 2017 until the end of June, just nine of the top 40 new songs were female artists or bands fronted by women. For noncommercial stations, it’s not just about ratings and hits. It’s about living up to the standards and expectations of public radio’s stakeholders: station members. Although female artists accounted for 40 percent of the new music chart during the week of the Non-Commvention, they didn’t continue to receive that same proportion of airplay over a longer period of time. Triple A stations might take a chance on a new song by a female artist, but that’s far from a guarantee that it will be considered a hit and given a long-term place on station playlists. Keep in mind that these are the numbers for the stations included Nielsen’s chart; it’s not a comprehensive look at all stations in the format. But it does give us a sense of what we’re dealing with: Women do not have an equal share of programming roles, and they’re harder to find the higher up the management chain you go. Other formats have started looking at these issues, too. Commercial stations are finally starting to question the long-standing idea that smart radio programmers don’t play multiple female artists back to back or put too many female artists into one hour. After “Tomatogate,” an incident in which a country-radio consultant compared female artists to “tomatoes” in the playlist “salad,” women in that format are galvanizing and have started conducting their own research to test the assumption that listeners do not want to hear female voices on the air. When it comes to challenging these assumptions and making the necessary programming changes, public radio has a unique advantage. For noncommercial stations, it’s not just about ratings and hits. It’s about living up to the standards and expectations of public radio’s stakeholders: station members. The numbers don’t lie, but things are changing. I regularly hear KEXP touting the inclusion of female artists on their station here in Seattle, and at the urging of host Talia Schlanger, WXPN recently began including an equal number of male and female guests on their NPR-syndicated show World Café. NPR is doing ongoing work with its “Turning the Tables” series, too. With more freedom than commercial stations to take risks with new music, noncom Triple A stations are in a position to lead the way on gender equality. It starts with an honest look at who has a voice at your station, on and off the air. An earlier version of this commentary was first published on The Top 22. Liz Felix is director of communications for the public radio show BirdNote. Her work in noncommercial Triple A radio includes the positions of PD at WNKU in Highland Heights, Ky., and assistant PD and music director at WAPS in Akron, Ohio. WMHT acquired an FM station in September that will now simulcast its WEXT signal.